Are you a tester? Then you know the famous “it works on my machine”. But if you are a mobile tester, then you probably already heard that “it works on the emulator”! However, even when it works on your test lab devices or your phone, does it works in the wild? Field testing is critical for the validation of any mobile application when it comes to connectivity, location or even devices and platforms. So, how to do it then? The most common solution is crowd-testing… But what to do if it passes on the crowd tests but it fails for your end users? Then the fun begins. You will need to go out and do the field testing yourself! Join this talk to share the lessons learned from a real field testing experience in a different country and with geographically distributed teams! Joel Oliveira started his professional career in 1998 as a researcher and since then, he already assumed different roles (from developer to tester, from technical and project manager to quality and engineering manager), managing and leading teams from 1 to 130 engineers in business areas so diverse as telecommunications, government and public sector, financial services, defence and security or aerospace. 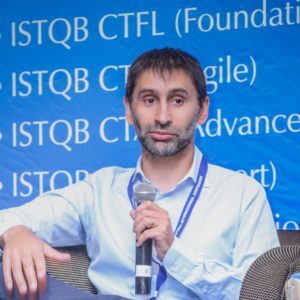 In 2009, after a closer involvement with the software testing area, he founded the first online testing community in Portugal and one year later, the PSTQB – Portuguese Software Testing and Qualifications Board becoming a member of the ISTQB working groups in 2011. As a passionate about software testing & quality assurance, dedicated to improve recognition/proficiency of the testing community and eager to share his experiences, you can find him giving talks and workshops about software testing (manual, exploratory, automation, mobile, performance, security), engineering processes (waterfall, agile, continuous improvement and CMMI) or career management (mainly but not only for testers).